2 ounces of what is considered the finest of silks, Bombyx. 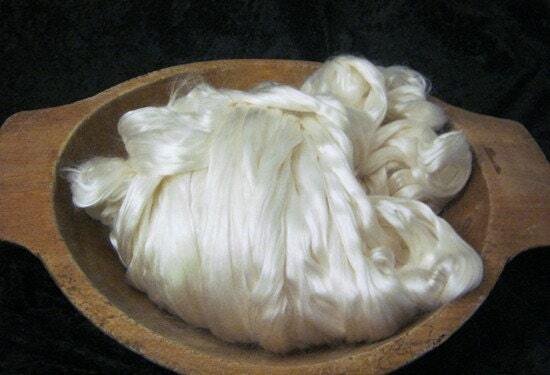 Also known as mulberry silk this fiber is what is known as combed sliver. It is naturally brilliant white from the diet of mulberry leaves the silk worms munch on during their lives. This roving is easy to spin from the fold and takes dye brilliantly. Available in 2 ounce lots. A little about myself. I started handspinning because I thought I could make yarn cheaper and better than the yarn I could buy. Well it opened up a whole new world for me. Since the the days of buying my first fleece (a Corriedale) I have studied under the likes of Rita Buchanan, Stephenie Gausted, Deb Robson, Abby Fraquemont among others. I gradually began to focus the wool from different breeds of sheep. I use this knowledge to curate the fibers I purchase. For quality, breed type and cleanliness. Some breeds it's hard to find all three qualities. But I know a good fleece when I get it in my hands and my goal is to provide you with a superior product at an affordable price point. If you are not satisfied with the roving I offer a money back guarantee. It is as simple as that. Questions? Don't hesitate to contact me. We are on Facebook as Emsket's Fiberworks. Stop by and see what we are up to. Thanks for stopping by and checking us out! Use this in my soap and it brings a beautiful “feel” to the finished bar of soap. I accept any payments that PayPal works with, including credit cards. Items must be paid for within 5 days. After that I will re-list the item. Illinois residents will be charged 7% sales tax. Sorry, but the state wants it's cut. Photos and monitors are not perfect. I make every attempt to post pictures that are as true to life as possible. If you need, I can exchange or refund (minus shipping costs) unused, unsoiled items within 30 days of payment. Soiled includes smelling of smoke. I have asthma and am sensitive to smoke. After I receive payment I will ship within 3 days. However, life happens. Occasionally I will go out of town for a couple days. I will make every attempt to contact you if something is delayed. One item is shipped First Class with delivery confirmation, two or more items are shipped via Priority. If the total is over $50 or the item is fragile I recommend purchasing insurance. Please contact me concerning adding insurance to your shipment. Shipments that weigh 4 pounds or more are shipped UPS. Please contact me if you are unable to accept UPS shipments for some reason. International Customers: I'm happy to ship overseas. Most economical for you and I is via the US postal service. I'm happy to ship your purchases as a gift. I can ship anonymously as well. If you need larger amounts of roving please contact me. I may be able to accommodate your needs. I am not wholesaling at this time. With locks they are generally one off colorways and I am unable to repeat them. Needle felting and spinning supplies available soon.